By Dr Julia K Steinberger, Associate Professor in Ecological Economics, Sustainability Research Institute, University of Leeds, United Kingdom. Reducing the risk of climate change requires large and rapid reductions in greenhouse gas emissions, most of which are caused by the burning of fossil energy sources (1). The debate around emission reductions has been dominated by concern for economic growth, and its reliance on cheap and plentiful energy. Instead, I believe energy’s role in achieving human development should be our core priority. The right to development effectively comes with a right to use some minimum level of energy, as recognised in the United Nations Sustainable Energy 4 All initiative and Sustainable Development Goal7. Because of the dependence of human development on energy, it is crucially important to understand how to maximise human development benefits at lower levels of energy use. This change in focus follows growing calls for a new research and policy agenda focused on achieving well-being within environmental boundaries (2). The graph below is based on my own analysis comparing the Human Development Index with per capita energy use (3). Here we see a high correlation between lower energy and lower HDI: a small increment of energy use corresponds to a relatively large increase in HDI (Figure 1). As energy use increases, we witness what economists would call “diminishing returns” in human development outcomes. And at higher energy use, there is no statistically significant dependency: the relationship shows evidence of saturation (4). The best-fit curve shows high human development (HDI above 0.7) was attainable at 50 GJ of primary energy per person in 2012. However, some countries with that level of energy use had already achieved very high human development (HDI above 0.8), while energy use above 100 GJ is well into the saturation area: many countries with lower energy achieve very high human development (5). For context, in 2012, the EU28 used 145 GJ/person, the USA 305, China 96, Brazil 63 and India 29. In fact, the energy associated with human development decreases significantly over time: in 1975 high human development required on average 100 GJ/person, and this almost halved by 2005 to 60 GJ/person (6). To explore this data, visit William Lamb’s interactive graphics website. Figure 1: Human Development Index and primary energy use per capita in 2012. It’s clear from the steepness of the fit curve in Figure 1 that it is far more “efficient” in human development terms to use energy in least developed countries, and far less efficient in highly developed countries (7). This effect is so extreme that if we redistributed all the energy in our 135 country sample to an average of 85 GJ/person, the average HDI would increase from 0.68 to 0.78: a leap of 0.1, to right below the “very high development” level. 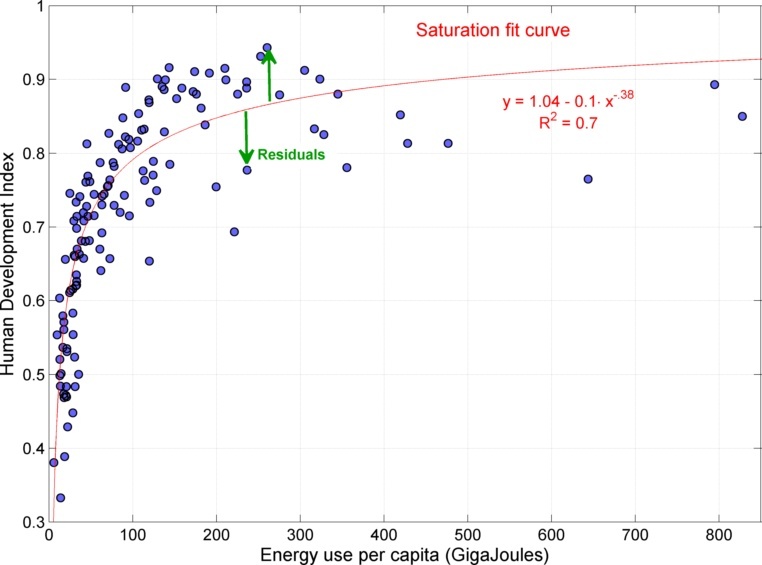 We can also measure the efficiency of countries at given energy levels, using “residuals” (8): the distance a country is located above or below the fit curve (see attached spreadsheet). Sri Lanka, Bangladesh, Switzerland and Ireland are countries with much higher HDI than would be expected given their level of energy use, whereas Nigeria, Ivory Coast, Oman and Trinidad & Tobago are countries with much lower HDI than expected given their level of energy use (9). This analysis raises some fundamental questions.Why do countries with similar energy requirements arrive at very levels of human development? How can we learn from countries with low energy use, but high human development? 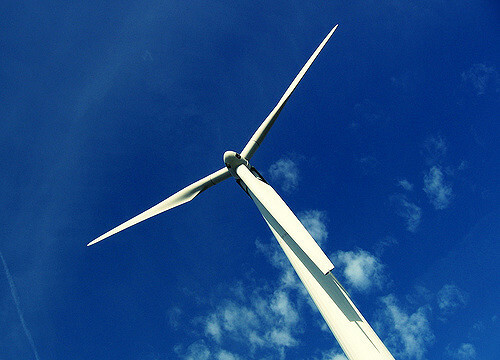 How can we understand the human development consequences of specific types of energy use? Recent research from the social sciences, which seeks to connect specific energy uses and human well-being (10), may point the way to well-being for all within planetary boundaries. The HDialogue blog is a platform for debate and discussion. Posts reflect the views of respective authors in their individual capacities and not the views of UNDP/HDRO. HDRO encourages reflections on the HDialogue contributions. The office posts comments that supports a constructive dialogue on policy options for advancing human development and are formulated respectful of other, potentially differing views. The office reserves the right to contain contributions that appear divisive. (1) IPCC (2014). Climate Change 2014: Synthesis Report. Contribution of Working Groups I, II and III to the Fifth Assessment Report of the Intergovernmental Panel on Climate Change, Core Writing Team, R.K. Pachauri and L.A. Meyer (eds), IPCC, Geneva, Switzerland: 151 pp. (2) Jackson, T. (2009). Prosperity without growth? Economics for a finite planet, Earthscan. Raworth, K. (2012). A safe and just space for humanity: can we live within the doughnut? . Oxfam Discussion Papers. Oxfam. Dietz, T. and A. K. Jorgenson (2014). "Towards a new view of sustainable development: human well-being and environmental stress." Environmental Research Letters 9(3): 031001. (3) Using the International Energy Agency’s measure of Total Primary Energy Supply. (4) Martinez, D. M. and B. W. Ebenhack (2008). "Understanding the role of energy consumption in human development through the use of saturation phenomena." Energy Policy 36(4): 1430-1435. (5)For a similar insight based on the ecological footprint, see the 2013 Human Development Report “Human Progress in a Diverse World”, Figure 1.7. (7) Dietz, T., E. A. Rosa and R. York (2009). "Environmentally Efficient Well-Being: Rethinking Sustainability as the Relationship between Human Well-being and Environmental Impacts." Human Ecology Review 16(1): 114-123. Jorgenson, A. K. (2014). "Economic development and the carbon intensity of human well-being." Nature Clim. Change 4(3): 186-189. (8) Knight, K. W. and E. A. Rosa (2011). "The environmental efficiency of well-being: A cross-national analysis." Social Science Research 40(3): 931-949. (9) An important caveat here is that IEA energy data does not account for energy embodied in traded goods & services. However, a similar analysis performed for trade-adjusted carbon dioxide emissions showed that the residuals decreased in magnitude but maintained the same overall pattern. See Steinberger, J. K., J. T. Roberts, G. P. Peters and G. Baiocchi (2012). "Pathways of human development and carbon emissions embodied in trade." Nature Climate Change 2: 81–85. (10) Mattioli, G. (2016). "Transport needs in a climate-constrained world. A novel framework to reconcile social and environmental sustainability in transport." Energy Research and Social Science.